In August 2010 the US Department of Energy (DoE) held a workshop dedicated to finding a path that will lead to US$1/W installed PV by 2017 – at least at the utility-scale. 82 participants from across the solar industry hashed out the pros, cons, and massive challenges. The goal is to launch this program within the first quarter of 2011. Basically the program involves separating all components of an installed PV system on the utility-scale, breaking each down by current cost and giving each a ‘goal cost’. The challenge is how to get to those cost levels. The National Renewable Energy Laboratory (NREL) is a key participant in the US$1/W Initiative and will be working closely with the DoE as it unfolds. Dr. Larry Kazmerski, Executive Director of NREL says: “For the visionaries, those who want to stretch goals, this is a welcome program. For the last dozen years, the U.S. solar program has stagnated, while trying to figure out what to do. Now, there is a real group with vision. This program is focused on bringing the total price of operating a completely installed PV system down to US$1/W by 2017. It is highly aggressive. Today all costs totalled, we are looking at US$7-US$9/W for a home system, more for business and industrial. So this is an incredible move. Dr. Michael Woodhouse works within the NREL Strategic Energy Analysis Center and is highly involved with the economic analysis of all PV technologies, working with a team at NREL and DoE: “We work together to get a feel for the costs and capabilities of different PV technologies, and also with industry to compile information into an aggregate form to look for the best opportunities for cost reductions. This is definitely not, and can't be, NREL or the DoE working alone or just in tandem with each other. We won't be the people who will be doing the actual manufacturing and installing of these systems,” Woodhouse says. “The Dollar-Per-Watt program addresses the utility-level to start off with, but you can clearly see that the program would certainly affect the commercial and residential level. It addresses getting a PV system cost-module and balance-of-system (BOS) down to a level that translates over to the wholesale cost of power delivery, or looking at a nationwide average of around US$0.05-US$0.07/kWh,” Woodhouse says. “While it's really a program for overall deployment to get the utility solar cost down to the wholesale utility-rate, tangentially, of course, there is the dollar-per-watt equivalent for residential, which is a competitive basis more around US$0.10/kWh. 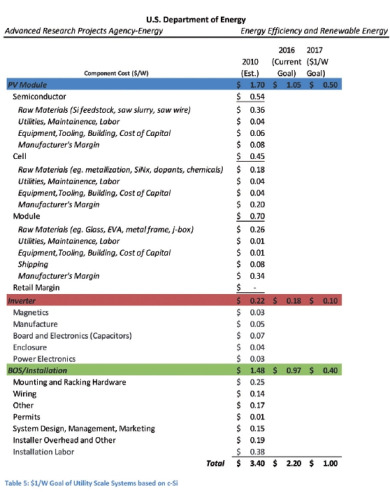 A dollar-per-watt at the utility-scale level would translate to a dollar/watt ‘equivalent’ of around US$2/W on the commercial and residential level. Woodhouse notes that what makes the conversion tricky is taking it from the dollar-per-watt system price and then converting that to the Levelised Cost of Energy/Electricity (LCOE). “LCOE looks at a the total costs over the entire lifetime of an installed PV system in dollar terms, and then divides it by the amount of energy produced over its lifetime, which is of course, very location dependent. So, after you have divided the total system cost by the total lifetime production of the system, the units of that calculation are the dollars per kilowatt hour. That is the real goal. Wherever the system is installed, you want that bottom line US$/kWh to be the same or lower than the US$/kWh from fossil fuel power,” he explains. “Further, the final goal is to have those costs at parity with each other without subsidies. “An LCOE calculation should do that, taking into the equation all the sunlight and temperature fluctuations for the area where the actual solar system will be installed. That will return the level of electricity cost for the end system. There is a lot of data we have that suggests that many of the PV systems and technologies that we have now are very close to fossil fuel prices in certain markets. In particular, there are many deployment scenarios in Hawaii and California that look to be close on the LCOE basis, even if all the incentives and rebates were theoretically taken away. “Any innovation that any area can come up with to meet the goal is valuable. All agree that it is definitely still an open game as to who, what, or which combination, will win. It might be something nobody thought of yet. There are some research programs set up to address the technology challenges. The program will also have the opportunities for many BOS level innovations too. This has historically been a neglected area, but there is a lot of data to show that the BOS costs right now are actually higher than the module,” Woodhouse says. He notes that a true balance of system cost estimate is very vague. The process that goes into it may or may not include the financing costs, the margins that people charge, and any other issues that may be project dependent. So the first challenge is to fully define all of the assumptions behind a true BOS cost estimate: While the labour and materials for the system are obviously there, the peripheral things need to be addressed, because they can be just as costly as the materials – or more so. 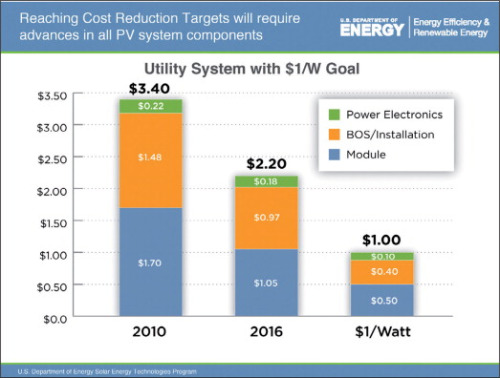 While the DoE Dollar-Per-Watt program is addressing the challenge of lowering the cost of an installed utility-level PV system, even there the ongoing LCOE will be very important and must eventually be part of the total system analysis figured into the overall system life use cost. Kazmerski says that while this is a reach for the U.S. PV industry, he believes that the industry is changing. Each in their own area of expertise must meet this, maybe first by obtaining US$4/W - then down to US$3/W-US$2/W - and so forth, because it simply has to be done. “Part of this whole initiative is to have a program that helps realign the current industries that are out there, which includes crystalline silicon, thin-films and leading edge things, into technologies that are indeed on a pathway to this US$1/W goal. Research support and policies and everything else needs to be analysed and adjusted to implement this. But even more than that, to leapfrog some of the new technologies that are still in the lab-development stage,” Kazmerski says. “I would be skeptical before, but if they are really going to push this and put money into it, some of those nano-technologies will come online a lot quicker. I think it is going to give the research community and the US as a whole a big boost. Woodhouse adds that this is a program set up to lower the up-front system cost first. It is too early to say that any one technology is the one to go with. “We need to look at all solutions, all technologies and accept that something new, a revolutionary technology might come along – something we are not even thinking about – that may actually do it. It is a completely open question, and one that is still in the very formative stage,” he says. A longer version of this article was published in the Jan/Feb 2011 issue of Renewable Energy U.S. magazine. Joyce Laird has an extensive background writing about the electronics industry; semiconductor development, R&D, wafer/foundry/IP and device integration into high density circuit designs.